I'm looking for link of who voted which way so I can work to vote them out of office. Also, where do we go from here? Legislature? 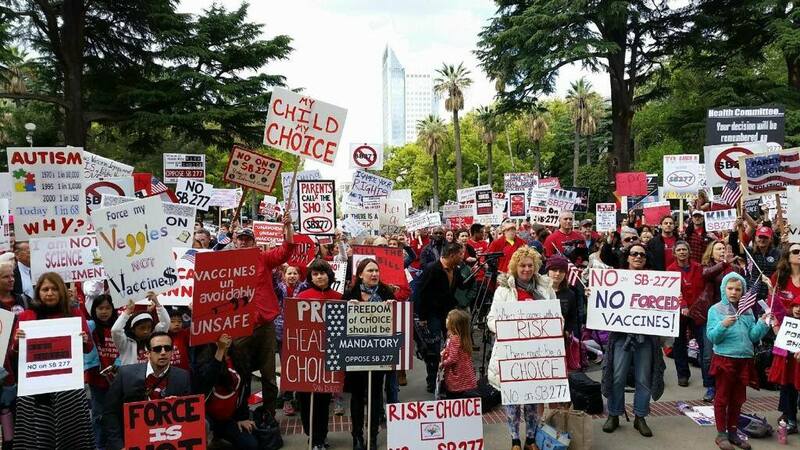 I too was at the capital opposing SB277, but didn't see many men in the sea of women opposing this bill. Maybe if the Father's and business men stand up and voice their opinions as well it would have helped. Where are the attorney's that oppose this bill...if you have the means and the knowledge use it to make a difference in your country. This whole thing is such an atrocity to the human race. Most don't even understand what saying yes to this bill is going to mean to them in the future, or even what consequence it will bring to their lives as well. They only believe it is about getting vaccinated.....that maybe a small part of this bill, but they are losing so much more than that. I think we could compare this to Auschwitz just on a smaller scale. And haven't I heard from many that would never happen again......well think again people I believe it is..
And we were told that the Nazis were bad. I've attended all three hearings, and will be attending the fourth next Tuesday, and all the rest after that. At the first Education Committee hearing, Pan stood at the lectern with a smirk on his face the entire time all 743 of us testified in opposition. I suspect he knew he had the votes, despite the ensuing lively discussion by the committee. Two senators, Connie Leyva, a Democrat, and Bob Huff, a Republican, deserve our accolades and thanks for voting in accord with the wishes of their constituents (Senator Huff was removed before the actual vote by the Dictator-in-Chief, Senator Kevin de Leon, but his replacement, Senator Sharon Runner, a Republican, also voted in favor of the babies and children, and deserves our thanks. Pan's action in getting permission from the lobbyist to proceed with delaying the vote, was not only blatantly illegal, but left no doubt this bill originated with the (legal) drug lords. Yes, the politicians are selling out our public safety and choice to Wall Street. I'm for informed consent with the right to refuse any vaccination or drug. Any law or process that denies this basic human right is in violation of the US Constitution, international law and the Nuremberg trial judgements that found Nazi doctors guilty of administrating unconsented deadly drugs and which included a stealth euthanasia program. Another deadly and controversial treatment is the mandatory Russian roulette stroke drug. The clot-buster drug for heart and lung blood clots has proven test trial and community hospital use results but for a non-life threathening ischemic clot stroke it's just the deadly opposite. Brain cells die within minutes of being deprived of blood in an ischemic stroke and the drug is being given hours later in the ER. Stroke clot-buster drugs have a history of deadly failed test trials and the 1995 NINDS trial claiming a possible long term recovery benefit is highly controversial. Stroke TPA does not save a person's life but can end it with it's signficant risk of causing a fatal brain bleeding hemorrhage. The NINDS stroke TPA trial data showed a 16% deadly hemorrhage rate for patients over 80. Europe does not approve approve stroke TPA for those over 80 but here in the US there is no such restriction. Protocol errors and BP management failures are both common and make the deadly hemorrhage risk even higher. Recent AHA Guidelines for Acute Stroke which hospitals follow state that stroke TPA can be given without consent. And many states now have low economic damage caps like California's MICRA law making it impossible to obtain an attorney in a wrongful death malpractice case when the victim has no job income(retirees). Hospitals should require a pre-stroke consent decision before stroke TPA is given. This is a basic patient right to consent. Other safer stroke recovery treatments are available like physical therapies and low risk drugs like Embrel. Search: AAEM TPA position, The NNT TPA stroke or in ER emergency blogs for the stroke TPA drug controversy or http://www.stroketreatmentrisktpa.co.nf . There is no reason for this fascist legislation except to increase profits for the drug companies. There is no medical necessity for this bill. ZERO. Don't be surprised if Pan ends up heading a major drug company or government agency as his reward.